At the 2011 Academy Awards, Rango won the prize for Best Animated Feature. Before the ceremony, however, some predicted a dark horse candidate could sneak in and nab the prize; that movie was A Cat in Paris. A Cat in Parisuses hand-drawn visuals, as it tells the story of Dino, a cat who lives a double life: By day, he’s friend to Zoe, a little girl who lives in self-imposed silence triggered by the murder of her father; at night, Dino accompanies cat burglar Nico across rooftops on various heists. Things get out of hand when Zoe follows the feline on his nocturnal activities, and it culminates in a showdown that centers on an organized crime ring. 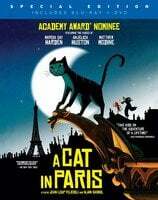 A Cat in Paris tells this tale in 64 minutes. One of the film most distinctive features is its visual style, with unique characters and an atmospheric color palate. Although released theatrically with French dialogue, these home video versions include English-language tracks with vocals by Marcia Gay Harden, Anjelica Huston, and Matthew Modine. A Cat in Parisis available DVD for $29.95 and Blu-ray/DVD Special Edition for $34.95, but you can find it for less at big-box retailers like Best Buy or online at Amazon.com.